Place the 9 octagon shaped pieces in the frame such that all touching edges have a matching symbol. This is a unique design by Dave Janelle, copyright Creative Crafthouse. 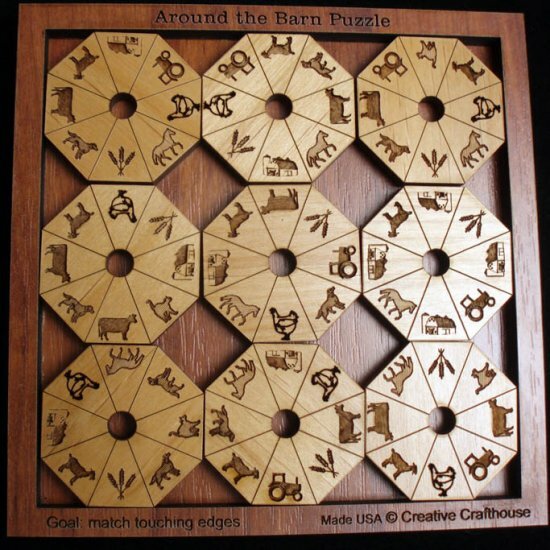 Symbols are scenes around the barn and include Barn, Cat, Cow, Horse, Dog, Chicken, Hay, Tractor, Goat. Symbols are deeply precision cut into the wood. Wood is 1/4" thick alder, very strong and durable. Frame are made from Floorboard and shades used may vary. This is a difficult puzzle as there are 8 symbols on each piece. Typical edge matching puzzles will have only 4 or 6 symbols on a piece. It will come packaged unsolved, though a written solution is provided. Dimensions: 6" x 6" x .6"
This puzzle seems like it would be easy...guess again! !